Founded in 1962 by moms with disabled children, Kindering now serves 4,000 families a year with science-based therapy. It has campuses in Bellevue, Bothell and Renton. November has been good month for Franco Calvo and his parents. 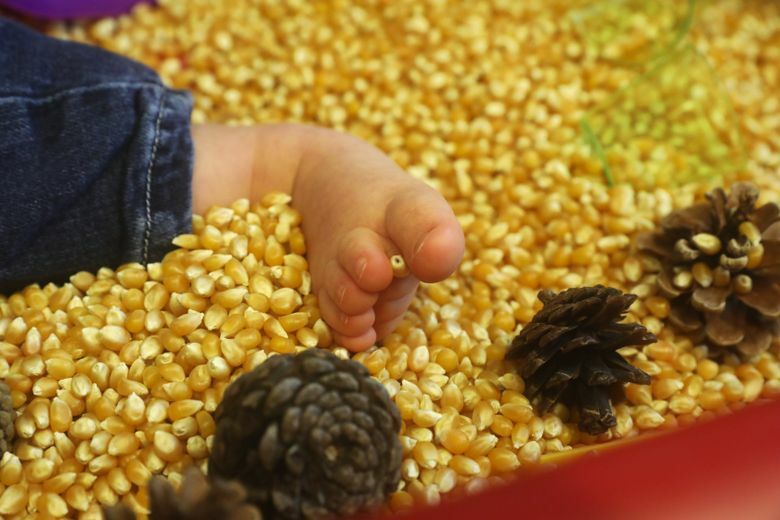 First, the youngster made a breakthrough in feeding himself, thanks to patient coaching at home and at Kindering center, which provides therapy for children with special needs. Then a brain scan found the seizures that struck the 21-month old soon after birth appear to have ended. Each year, The Seattle Times Fund For The Needy raises money for a group of charities that help children, families and senior citizens. Throughout the season, The Times is telling how the 12 organizations make a difference in the lives of thousands, and the impact donors can have. Click here to make a tax-deductible donation to the Fund For The Needy. “That’s probably the best news we’ve had in two years,” said Franco’s dad, Rodrigo Calvo. The Kirkland family has been grappling with worry and uncertainty since medical tests during Elsa Calvo’s pregnancy gave conflicting results on the possibility of Down syndrome. The moment he saw his newborn son’s face, Rodrigo knew the possibility had become reality. The couple embraced their baby with love, joy — and concern for his future. “The feeling was: Welcome to this world. We’re going to take care of you,” Rodrigo recalled. But until they connected with Kindering, the Calvos didn’t really understand the kind of special care their son would need, or how best to foster his development. “I don’t know where we would be without them,” Elsa said. One of a dozen nonprofits that share in The Seattle Times Fund For The Needy, Kindering was founded in 1962 by a group of mothers struggling to raise disabled children at a time when social services were scarce. Today, the organization serves more than 4,000 families a year with campuses in Bellevue, Bothell and, most recently, Renton. The focus is on the critical window from birth to 3 years of age, when children’s brains are at their most flexible and therapy can lay the foundation for a better future. “The earlier the intervention occurs, the more skills they get earlier on, the more successful they are going to be throughout their lives,” said Courtney Nolan, a special-education manager at Kindering. 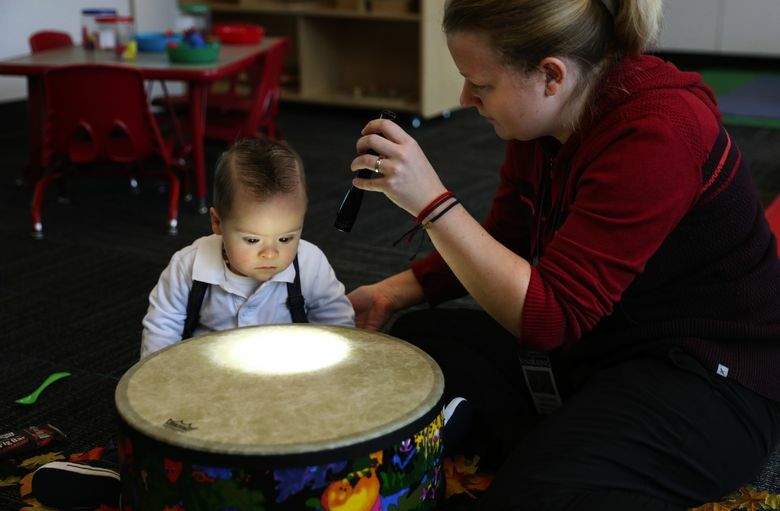 Kindering provides education, therapy and support for children with disabilities or developmental delays — and their families — from birth to 3 years of age. Franco’s therapy regimen through Kindering’s Bothell center started when he was 2 months old. Like any baby, he was soaking up information about the world and learning to navigate through it. Down syndrome complicates the journey with an array of challenges, from weak muscles and imperfect vision to cognitive problems, all of which Kindering’s programs are designed to help counteract, Nolan explained. Franco was doing well — until the seizures started. Franco was diagnosed with a rare condition called West syndrome, a severe form of epilepsy. Much of the progress he had made in therapy was erased. Drugs helped calm the spasms, and Kindering’s staff started anew with occupational, physical and speech therapy. Through Kindering, the Calvos got to know other parents with disabled children, who shared their stories and advice. The organization also welcomed Franco’s big sister, Josefina, now 3½, to a program where siblings get special attention and share their feelings about having a disabled brother or sister. “Kindering not only helps Franco move along in his development, it helps all of us to understand we are not alone,” Elsa said. Working with the entire family is fundamental to Kindering’s approach, Nolan said. Parents are the primary caregivers, so it’s important to equip them with the skills they need to help their child. Kindering’s experts helped Elsa and Rodrigo learn to better read their son — what his body language says about his moods and how to figure out what he wants. They’ve also learned to examine and adjust their own expectations. Elsa, 36, is used to rushing around. Now, she has to slow down to match Franco’s pace. Rodrigo, 40, has always been a stickler for table manners. But Kindering’s therapists explained how important it is for Franco to play with his food in order to feel the texture and become familiar with it. On a recent morning at Kindering’s Bothell campus, Franco demonstrated his touch technique, grabbing and squeezing chunks of a fig bar. Bringing a tidbit close to his mouth earned applause from his enthusiastic teachers. 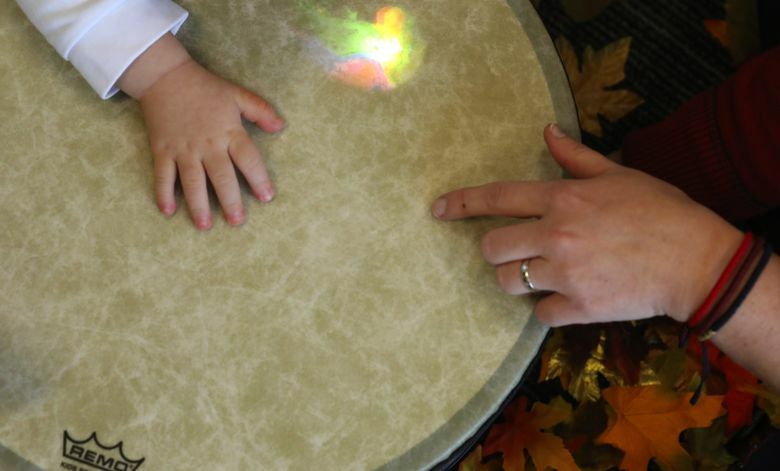 In other lessons, all couched as play, Franco leaned in to feel the rhythm of a drum, followed a flashlight beam with his eyes and smiled at soap bubbles floating past his face. The Calvos are bilingual, so Franco’s therapists speak to him in Spanish and English. Across the region, Kindering helps families that speak 90 different languages. With a staff of more than 180, the organization doesn’t turn anyone away. Funding comes from state and federal programs, school districts, private donations, insurance and modest fees from families who can afford them. Kindering serves children with a wide range of disabilities, from cerebral palsy and autism to less-severe delays in development. The organization’s own research shows that nearly half of kids who get early intervention catch up with their normally developing peers and don’t need special-education services in school. That can be a big money-saver for school districts, since special education can cost more than $50,000 per student. 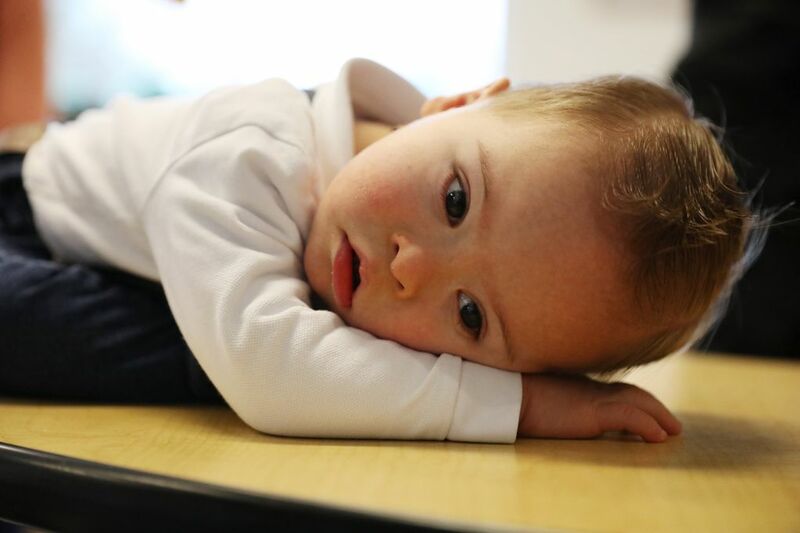 Children with genetic disabilities like Down syndrome and more profound brain damage may never catch up with typically developing kids, but Kindering’s programs help narrow the gap and can set them on the road to a more independent life, Nolan said. Rodrigo, an operations manager for a cellphone company, is certain the outlook is brighter for his son than it was for his aunt. Born with Down syndrome in Mexico in the 1940s, she never got special education or therapy and spent much of her life with only her mother for company. And if higher education is in Franco’s future, the Calvos will be ready. They’ve already started a tuition savings account for him, just like they did for their daughter.